Video gaming is now a rapidly growing market in Africa, and start-ups are springing up across the continent to produce games with African themes. In Kenya, the video games market was worth over $50m (£38m) in 2016. It’s expected to double by 2021. Weza Interactive, based in Nairobi, is one such developer that is trying to make interactive content for and about Africa. It has released a free platformer mobile game called Mzito. In the adventure game, which is available on both iOS and Android, users play as a lion, who with the help of ancient spirits must save Africa from “ancient corruption”. “We wanted to focus on the African theme because we think it’s time for Africa,” Weza Interactive’s chief executive George Ohere told the BBC. Ludique is a game developer and publisher in Nairobi that is working with more than 2,000 video game contributors from across the continent. 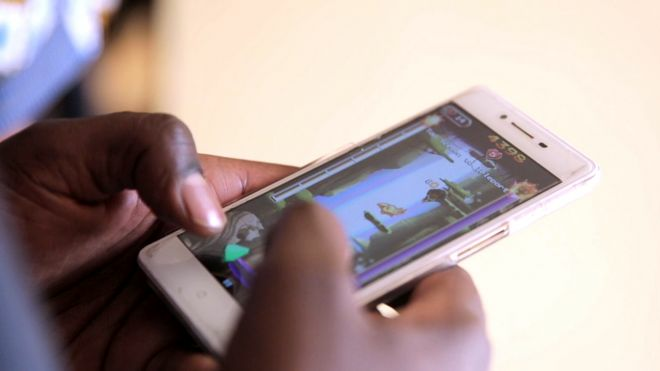 “The African video gaming industry is a nascent industry and we’ve got a lot of developers who are doing this as a part-time thing,” Ludique’s chief executive Lilian Nduati told the BBC. The company’s dream is to see video game development reach a point where firms are able to break even and offer people full-time employment. It is also important to improve representation of the continent on the world stage, according to Ms Nduati. “We’ve got young Africans who have travelled, they’re widely exposed, they’re thinking, ‘Hey, how come I’m not seeing someone who looks like me or speaks like me in some of the games that I’m playing?’ So what we’re trying to then do is fill the gap,” she said. Mr Ohere studied software engineering in China and came back to Kenya in 2016 with the dream of being a game developer. At the time, there were no video game companies in Kenya, so he decided to start one with his brother James and friend Joshua Ayugi. Despite receiving funding from incubators and competitions, the founders continue to moonlight in app development, accounting, law, IT support and cybersecurity to pay the bills. The developer said that the game has so far been well-received in Kenya, and it is now in talks with game publishers and mobile operators to distribute the game worldwide. In total, the app has been downloaded 20,000 times on all platforms so far.